AMD's latest chipset raises the bar by another level when it comes to provided features in the mainstream product space, a category that is actually pretty varied and open to a lot of different products with different usage models, and AMD's B450 is the perfect example of that. The B450 chipset replaces the B350, and while doing so, functionality-wise, it actually doesn't change all that much, other than upping the performance ante to the level of the X370. This is in part because with the B350, things like XFR and Precision Boost are not present, but with the B450, they are, making boards based on this chipset (and AMD's Promontory X470) perhaps the best option for AMD's latest 2000-series processors. We do also get AMD's StoreMI technology, which is similar in idea to Intel's Optane blending together SSDs and HDDs into one large drive, but without the drive choice restrictions, and that might be the most important thing this new chipset offers, and unlike lesser Intel chipsets, AMD's B450 also allows for full overclocking rather than limiting you with BIOS locks. So we've got a reduced-capacity chipset with all the enthusiast features retained? That makes it a great option for smaller motherboards since this makes for less wiring within the board itself as it's things like SATA ports and PCIe connectivity you lose out on with AMD's mid-level chipsets. 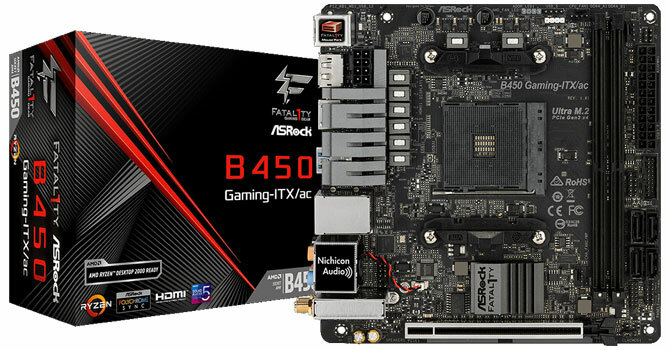 With so much compute power available within small power envelopes, building a small Mini-ITX system is a great enthusiast option these days, and our favorite company to have out-of-the-box board ideas is none other than ASRock, so of course, I've got a Mini-ITX B450 board from them, the ASRock B450 Gaming-ITX/ac. 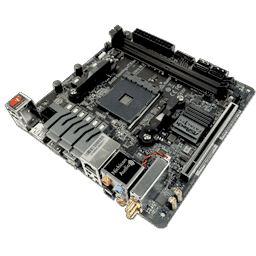 The ASRock B450 Gaming-ITX/ac is a small, gaming-oriented Mini-ITX motherboard with a fairly decent set of capabilities, making it a great option for those of us looking to build a smaller system for gaming, no matter the Ryzen performance level you want. With onboard video outputs, this board is capable of pushing both AMD's 2x00 APUs and the 2000-series CPUs, along with a single VGA or maybe a RAID card. Add in Intel Dual-band Wi-Fi along with an Intel LAN port, a Realtek ALC1220 audio CODEC, and support for memory of speeds up to 3466 MHz+ along with ASRock's latest RGB implementation, Polychrome RGB, and you've got a great base for a tiny and powerful gaming system capable of playing any game.